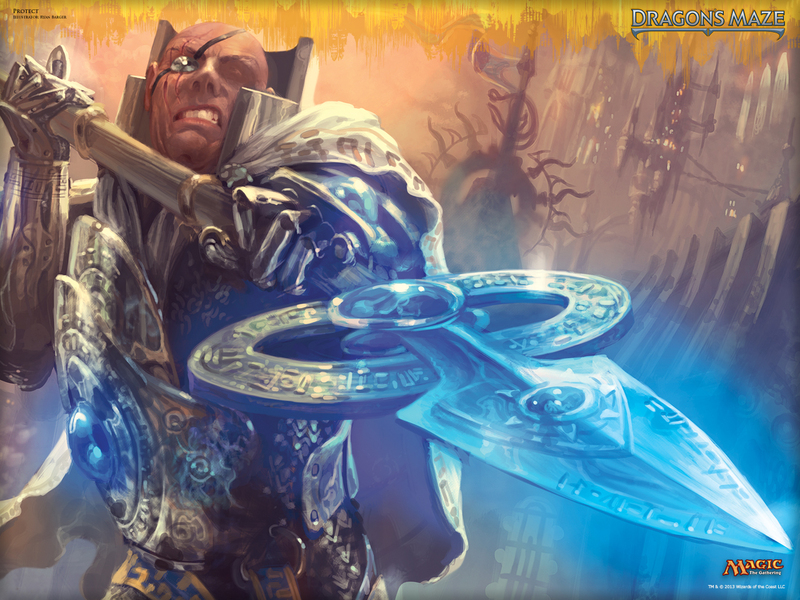 By the time you read this, it will be a few days past the Magic 2014 pre-release. While you were all jammed together with sweaty nerds in the heat of July in card shops without air conditioning, I will have been tanning getting burned on the sunny sand of Myrtle Beach. We’re all back to the real (fantasy) world by now though, and my goal is to provide some additional perspective on the fiscal axis of M14. Before we take a look at any specific cards, there’s a well-worn point that yet bears repeating: purchasing or trading for cards at this point in the set’s life cycle is almost unquestionably a poor choice through the lens of value. For every Sphinx’s Revelation or Voice of Resurgence, there are a lot more Armada Wurms or Koths. 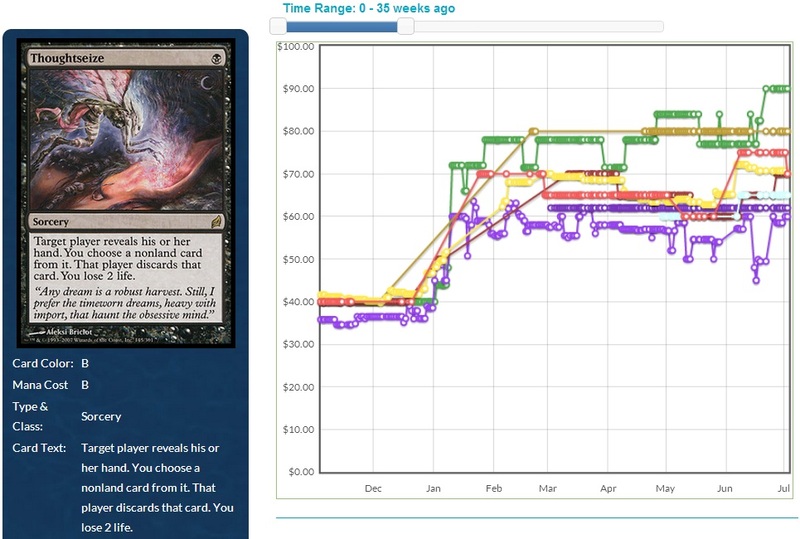 A set’s cards just cannot maintain the price attributed to them during the pre-release period. Anything you buy into is significantly more likely to lose value rather than gain. If your goal is to make money, you have to be exceptionally confident that you’re better at predicting a card’s trajectory than many other very intelligent people attempting to do the exact same thing. About the only time I would really recommend getting in now is if you notice a very powerful, very obscure combo that nobody else seems to have picked up on yet (e.g. Dark Depths + Vampire Hexmage.) In general, it is far more prudent to wait several weeks for the prices to settle to reasonable levels, and then jump in. If you’re picking up a playset because you need it to compete, or your goal is to hedge against future price increases, that’s understandable, but speculating this early on is a fool’s game. A strategy I like to use for pre-releases is to go in with a plan. If I show up without any trade targets in mind, I let myself get caught up in the hype and end up trading for cards that have nowhere to go but down. Instead, sit down and open up the notepad app on your phone. Make a short list of specific cards you’d like to acquire. That way, while everyone else is chattering about the new cardboard, you can be trading your inflated property for under-valued targets that will be rising in coming weeks rather than falling. That said, let’s take a pass through the spoiler and see what catches our attention. The reason I put this card first is because this card is b-a-n-a-n-a-s oozenanas. I’m convinced that anyone that dismisses its power level has simply never cast it. The ability on this guy ranges from tangentially useful to game-dominating. In his worst matchups, he’s a reasonable threat that keeps growing while the life-gain and graveyard-consumption will be inconsequential. In some of his better matchups, he’ll provide you enough life to race or keep your head above water against aggro. In yet others the ooze will singlehandedly shut down your opponent’s strategy by blanking their entire graveyard. Read Ooze again: it exiles any card, not just creature cards.Granted you only get the +1/+1 counter and the life from slurping up corpses, I don’t think you’ll be complaining when your ooze is happily munching on Unburial Rites or Past in Flames. He’s not a one-ride pony, either. Every girl at the party gets a turn: Scavenging Ooze is going to be even more important in Modern than Standard. Out of the top 16 decks from GP Kansas City, there was exactly one deck that didn’t care about its graveyard at all. Read that again: one out of sixteen decks had no interaction with their graveyard in Modern. The rest had some combination of diverse threats such as Tarmogoyf, Snapcaster, Kitchen Finks, or Goryo’s Vengeance. He’s going to have incidental value against a gigantic swath of the field, and be a severe threat to a significant portion. Here’s another way to appreciate his wide-spread application: in Legacy, Maverick decks cut Tarmogoyf completely for Scavenging Ooze. Thragtusk. August 2012 – July 2013. While there are fewer copies of Thragtusk in circulation, Scavenging Ooze is relevant in every real format. So overall, there will be more copies of Ooze available, but both more and longer-term demand. With that consideration, if Ooze ever gets below $10, I’d start getting in aggressively. I expect his demand will spike once the Modern PTQ season begins and he’s needed concurrently in Standard, Modern and Legacy. Even if for some reason he didn’t rebound while he’s still legal in Standard, he certainly will once M14 rotates and he continues to be a premier 2-drop in Modern. I’m a lot less excited about this card than many in the multiverse are, and I’m seeing conflicting reports. Gerry T thinks she is reasonable, but isn’t too high on her making that much of an impact. Sam Black didn’t even mention it in his set review. Meanwhile, others are hailing her as the venerated Real Deal. The closest thing I can liken Archangel of Thune to is Sublime Archangel. Both are midrange white angels that want to beat your opponent up, and reward you heavily for having lots of bodies. Sublime Archangel showed up a little over her tenure, although accomplished nothing of note. Having said that, Sublime Archangel spent months above $20, and only recently slipped below $10. Archangel of Thune is a mythic, an angel, and the type of player that likes angels is likely to like lifegain. Sam Stoddard also pointed out some nifty synergies with things like Seraph Sanctuary. Her usefulness really depends on what sort of methods there are to gain life. A soul warden on steroids in Theros could certainly push her over the edge. Overall, I think $30 is unwarranted, but even if she sees absolutely no play in Standard, she’ll likely be $6-10. With only transient Standard play, $15-20+ is certainly viable. This card is probably the one on the list I am most unsure of. He’s currently $2 on SCG. If you can get these for $1 in trade, I’d get in on it. Double Strike may as well be Alpha Strike. 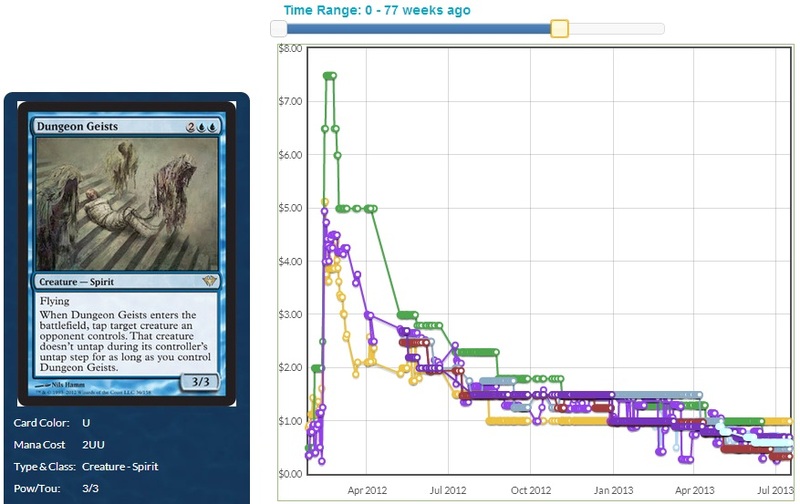 It never even has to do anything relevant in Standard to be worth $3-4 at some point due to it being a Sliver. Plenty recognize this for the gut-wrench-inducing effect it is against some players. I personally remember playing Turboland, ready to untap and unleash a torrent of spells with my 9 lands in play after finally stabilizing against a red deck. Then he cast Manabarbs, and I basically lost on the spot. This will be capable of similar gastrointestinal torment. It’s only $1 on SCG at the moment, but with only a single copy in stock. I can’t imagine ever having to take less than $1 for this in trade, and it could easily be a several dollar card, as it has a distinct chance of transcending sideboard-grade into being main deckable. This will be great to try and pick up as a throw-in from players that remember Manabarbs being a cheap card, forgetting that there were 11 printings. There has already been a fair amount written about Chandra so far by others. Without reading a single word on the card, it’s important to consider the climate into which this card is released. M14 has Chandra’s face plastered all over it. I find it unlikely that Wizards would make her the central theme of a set and then put out another smoldering pile of a planeswalker. My gut feeling is that, like many planeswalkers, she’s better than people are originally giving her credit for. $25 is definitely far too much money to for us to be interested, but there’s certainly a point at which we get in. Gideon, Champion of Justice is $4, and Vraska is $7, so I’d say $5 is roughly her floor. With that in mind, keep an eye out for how she fares in the format, and look closely at anything we learn about future sets that may indicate a greater value in her abilities. There may be a lot more relevancy to “can’t block” in Theros than there is right now. It’s also worth noting that after going all out with her in M14, it’s unlikely they’ll do a complete redesign just a year later, so expect to see the Pyromaster in M15 as well. This card seems like one of the better chances to be a sleeper out of any I’ve seen so far at a mere $1. Several players who are far better than I have gone out of their way to mention how good it seems. In a format where removal is sparsely played, a 1/1 that generates a powerful effect repeatedly is king. It could end up doing nothing, but Dungeon Geists were $1 at one point too, then everyone saw Jon Finkel casting it. I’m not saying this card is Dungeon Geists, but rather we shouldn’t be too quick to dismiss it. Dungeon Geists. Feb 2012 – July 2013. $8 seems way too high for this guy, but I like him a lot, and not only because my inner 17 year-old thinks his art is super sweet. He’s not quite protection from Black or Red, but protection from Black and Red removal is still solid. We’ve already had a 2/2 first strike lifelink for WW before, so we’re only paying 1 for the added pseudo-protection. With Doom Blade and Shock in the M14 spoiler, he’s probably going to be safe from a majority of the removal in the format. If in the next few weeks we see Standard shift to all Doom Blades and Pillars and Incinerates, he could be great in 3-drop Hexproof with a pile of mana dorks next to Witchstalker and Geist. 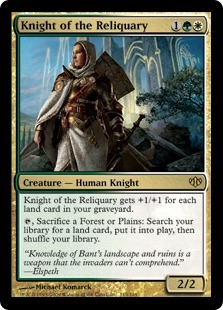 It’s also possible that Knight ends up being a relevant creature type in Theros. Watch this guy closely. At worst, you have a playset of sweet-looking Knights. I haven’t read as much about Garruk as Chandra, but he seems real legit, and it’s easy to imagine scenarios where he’s just busted. A turn one elf with a Farseek sometime in the next two turns means a turn 4 Garruk, who spits out an Armada Wurm. You could have just cast the Armada Wurm, but now you get a Planeswalker that’s threatening a never-ending stream of action next turn and two blockers to make sure he gets there. There’s also the combo-esque element of him where you’re slamming Craterhoof Behemoths into a board full of elves and Elvish Archdruid, or putting Worldspine Wurm into play seven turns early (at FNM). I’d watch him closely, because if he drops below $10 at any point, a single breakout performance at a GP (likely at the hands of Brad Nelson or Brian Kibler) will quickly double his price. A 2-mana 2-power creature is always close to castable in certain Standards. A 2-power 2-drop that puts your opponent’s ability to block behind by an entire turn is definitely playing ball. While very similar to Blind Obedience, I’m guessing that 2-power attacker will be worth more damage than extort in most games. Reading Twitter, I get the impression this card may be slipping through some cracks at the moment. It’s preordering sold out at $3 while I write this, and it seems like it could quite easily be a $5-$8 card depending on how prominent it becomes. I’d watch this very closely, because this is the exact type of card you can get people to under-value in a trade when it starts to sneak up. Speaking of which, I find it odd that Wizards would print this on the heels of Blind Obedience. It leads me to believe that the “no blocking” mechanic may be particularly relevant in Theros. It’s not limited to just these two cards, either. Blind Obedience and Imposing Sovereign are similar in a sideways manner to Chandra’s +1. Not blocking is shaping up to be available in several flavors at the moment. 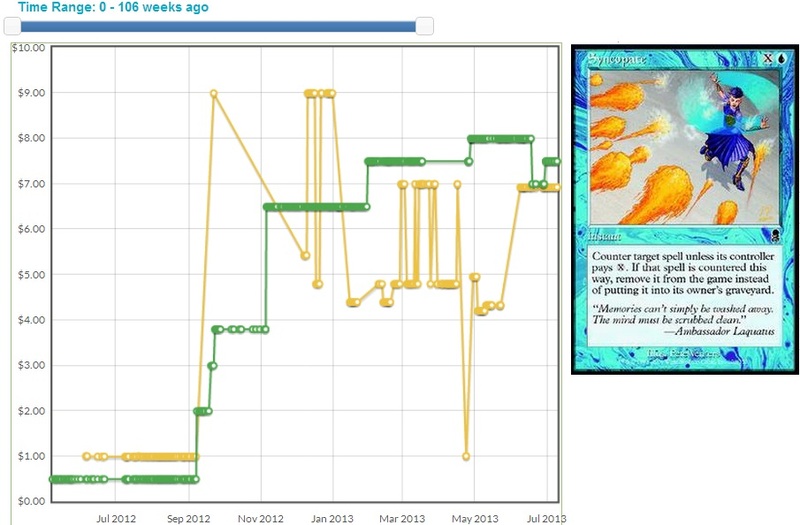 Sam Stoddard mentioned that the synergy in M14 with the fall set is a lot more subtle than Farseek and Arbor Elf were. Maybe it’s something, maybe it’s not. Zvi Mowshowitz was talking about this card, and when Zvi goes out of his way to discuss particular cards, I pay close attention. It has a lot of hype right now, and is sold out at $30. This number is inflated without any results, so unless it comes thundering out of the gates, expect a pretty rapid crash. As a Mythic though, it will always have the possibility of tripling in price after spiking an event. It certainly is the most competitive Hydra printed so far. It suffers from the MTGS-maligned problem of doing nothing except eating doom blade before your attack phase, but when it attacks, boy does it ever. Don’t forget that this hydra is BFFs with Corpsejack Menace, taking advantage of the replacement effect twice by the time he’s in the red zone, meaning he’s a whopping 24/24 trampler. As far as “do nothing” creatures go, he does nothing until he’s sideways and killing your opponent. Like several other powerful cards without an immediate home, this has the possibility to pull a roller-coaster. Skyrocket pre-release, crash post-release, then spike an event and skyrocket again. Cards of this type have historically been too weak to see play by any but the most mindless zombie aficionado, whether because they cost too much or don’t do enough when you finally get them to connect. Reaver has an outside shot at bringing honor to his genealogy though. It gives you another attacker next turn, and makes it tougher for your opponent to fight back by stripping resources. Remember when I was talking about how many ways there were to make blocking less reliable in this format? You’ve also got the semi-hyped Lifebane Zombie to remove any restorative angelic figures that may swoop in unexpectedly ahead of time. This is card I’ll definitely be trying to get as a throw-in during trades. If it goes nowhere, it won’t have cost me much, and if it does, I’ll look like a genius. Edit: I wrote this bit about Liliana’s Reaver before I realized it was an intro pack rare. I’m leaving my initial reaction to him intact so that you can see the thought process. Let this be a lesson that it’s important to be aware of additional product Wizards is putting out and the impact that product will have on card prices. All in all, that piece of information sets his ceiling a little lower than I anticipated; perhaps around $4-5. Still, there’s room to profit on him as good throw-in fodder. $15 for this card is close to the cheapest it has ever been. Mutavault been a player in Legacy for years. It hasn’t done too much in Modern yet, but that’s to the surprise of many. That format is rather combo-heavy at the moment, but if Wizards decides to push things back towards battling again, it could quickly become a big player. I can definitely see it seeing play in a basic-heavy list alongside Burning Earth. Helping it’s case is that almost any deck that wants one Mutavault wants four. I don’t see a time this card was ever less than $10, so I’d be willing to get in on any copies I could get at that price or lower. Even if it doesn’t immediately rebound, it will in time. If you untap with Ogre Battledriver, your opponent is in a world of hurt. Can you imagine casting Increasing Devotion with this in play? Hah. It also works pretty well with Young Pyromancer, another card lots of red mages have been chatting about. The biggest hurdle to overcome here is that he’s an intro pack rare, which will set a pretty low ceiling on him. Even so, $3-5 isn’t impossible. If you’re paying almost nothing for him in a trade, I’d go for it. I don’t really care for Path of Bravery, but players better than I think it’s worth discussing. I bring it up because at the moment it’s only $2 on SCG. Any lower and it’s a fairly low-risk target. I only mention this card because as I was flipping through the spoiler, saw the art, recognized the card, and in my head guessed $.50. Then I saw it was A) a Mythic, and B) sold out at $8. What? Let it crash to $1 before you pick it up for EDH. Just pointing this out because two weeks ago I told you how to avoid getting hit by reprints, and this card was most assuredly reprintable. This is not a $6 card. This is not even a $1 card. Certain players really, really hate counterspells. Don’t be suckered into trading for it. Look for cheap foils. He will be popular for dragon-centric EDH decks. A quick note about all five planeswalkers – there is going to be an all-black promo of each at San Diego Comic-Con this weekend. In traditional Wizards fashion with limited-run product, the box of five will retail for the ludicrously low price of $65. It’s going to be available at SDCC, then there’ll be what I’m assuming will be an incredibly small supply available on the Hasbro website following the event. These things are going to be bonkers expensive. First of all, they’re going to be real scarce. Probably Book Jace scarce, who by the way is currently about $180. Second of all, they’re not just a simple alt-art promo; they’ll be the only Magic cards in existence to be printed with this design. On top of all this, not only is it an incredibly unique style, they also happen to be all black, which will certainly appeal to the angsty teen that is still alive and well in the heart of many anime-watching Magic nerds. I fully expect sealed packages to be $500 within about a year, and I see it entirely possible they’ll be $700 or more down the road. The only thing that will prevent these from hitting astronomic prices is that we already know three are virtually uncastable outside of Standard, and I don’t have high eternal hopes for the new Garruk or Chandra either. 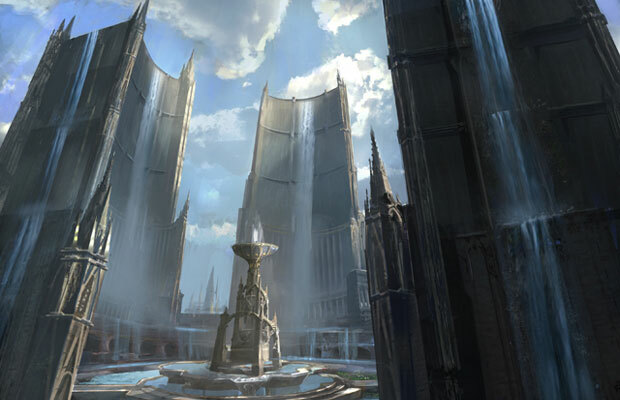 For several years, Magic players have consistently placed a premium on trading into “Legacy Staples”: cards like Force of Will, Lion’s Eye Diamond, and any Dual Lands. The appeal was that even if you didn’t have an immediate outlet for the card, its value was very secure – particularly if the card was on the contentious reserve list. This practice contrasts with a policy of picking up Standard staples, which are prone to frequent and occasionally violent shifts in price. Trading for Modern cards leaves us in sort of uncharted territory, however. On the one hand, price swings downward are less frequent and less rapid than in Standard. On the other, there is no reserve list, so the threat of reprint hangs heavy over the head of every card. Modern is a field ripe for investing and profit, but it’s important to minimize our risk in a field fraught with uncertainty. This week I will discuss potential hazards in Modern trading, and next week we’ll evaluate safe options. Our goal is to identify targets with increased chances of being reprinted, as that is something we can attempt to predict and will allow us to minimize any potential losses. There are a few critical factors when considering reprints: keywords, ties to specific flavor, adaptable mechanics, and general utility. Cards with specific Keywords are much tougher to reprint. 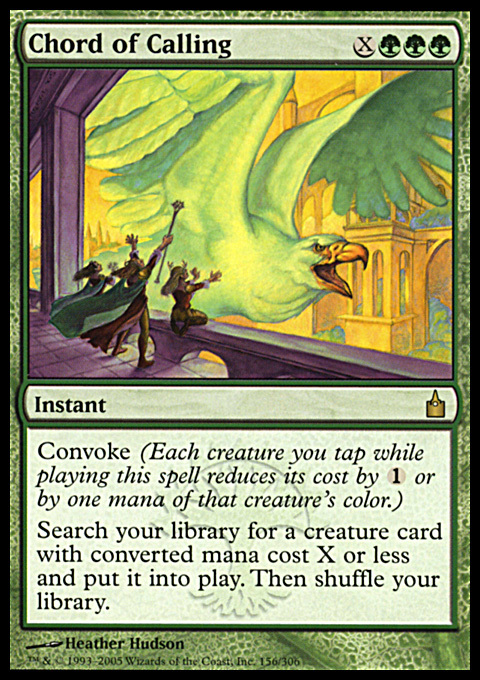 Something like Chord of Calling can’t show up in a core or expansion set unless the set also contains Convoke, and repeating keywords happens rather infrequently. Additionally, once a keyword’s presence in a set is known, you typically have some time to ditch excess copies before a reprint is confirmed. This leaves only supplemental product as an unpredictable potential pathway for more copies of the card to appear: GP Promos, Modern Masters, Planechase, PT Promos, etc. Cards without keywords can be slotted into new sets, allowing them to theoretically be part of any group of cards Wizards lets out the door. Similarly, cards with ties to specific flavor are much tougher to reprint. Inquisition of Kozilek has the mechanics of a French vanilla discard spell, but the mention of Kozilek means that it can’t appear in an expansion or core set unless that set has something specific to do with the Eldrazi. I’m guessing it’s still probably a little early for their eldritch return, so like keyworded cards, unique flavor mostly restricts reprints to special print runs. The oracle text of the card matters as well. How universal is the card’s effect? Path to Exile has nothing in the rules text that could be tied to specific block’s mechanics. This card is a mono-color instant that references creatures, exiling, and basic lands, which are all things that are in every block. Finally, how useful is the card? Is the effect something that has been historically universal, or does it have a very narrow application? A card like Blood Moon would have been fairly low-impact in Innistrad, as there was nothing particularly unique or degenerate about the manabases at the time, but would be a huge role-player in a Shockland-dominant format where basics are few and far between. In contrast, Dark Confidant is going to be Dark Confidant so long as there are black cards and life totals, irrespective of the format around him. It’s feasible they could craft a Standard format where he isn’t very good, but I don’t think it’s a world any of us want to live in. Look at these four factors when considering whether a card is likely to be reprinted, and invest wisely. If the card has no characteristics that make it resistant to reprinting, tread carefully, especially if the card has seen a spike in price recently. Large and rapid increases indicate a high price volatility, which indicates that the card’s value can be easily swayed. If nothing more than rumors, perceived scarcity, speculation or a single event is driving severe changes, then it has yet to find a stable price, and a sudden influx of copies could have a dramatic effect. This is in contrast to real estate like a Dual land, whose value is far more insulated from current events and is unlikely to shift by too many percentage points at any given time. Next week we’ll look at what types of targets are considerably safer, and may even see upside from being reprinted. 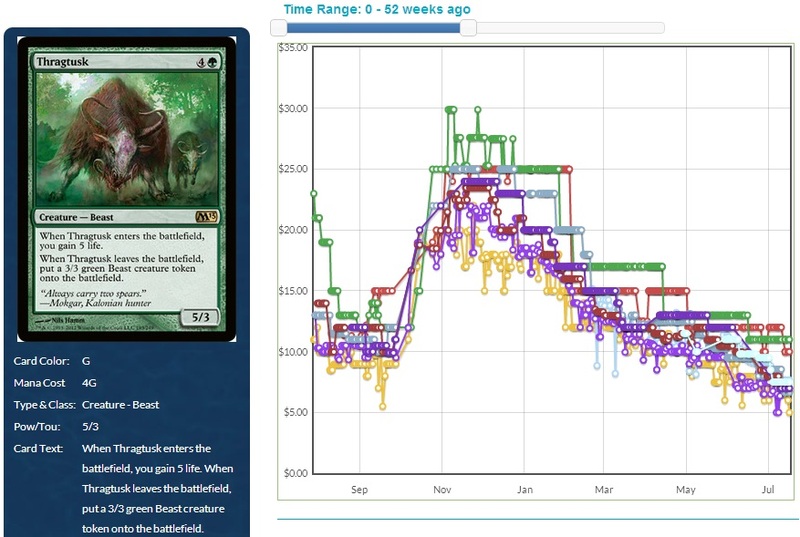 By the way, know what card carries not a single marker that would inhibit reprinting, has doubled in price fairly recently, is heavily represented in the Twitter rumor mill, would have its power level tempered by a shockland format, was in a small card pool that Wizards has specifically identified as wanting to provide increased accessibility to, seemed an ominous omission from Modern Masters, and is at an absurd price for being a no-nonsense utility card? Thoughtseize, with a current Fair Trade Price of $69.